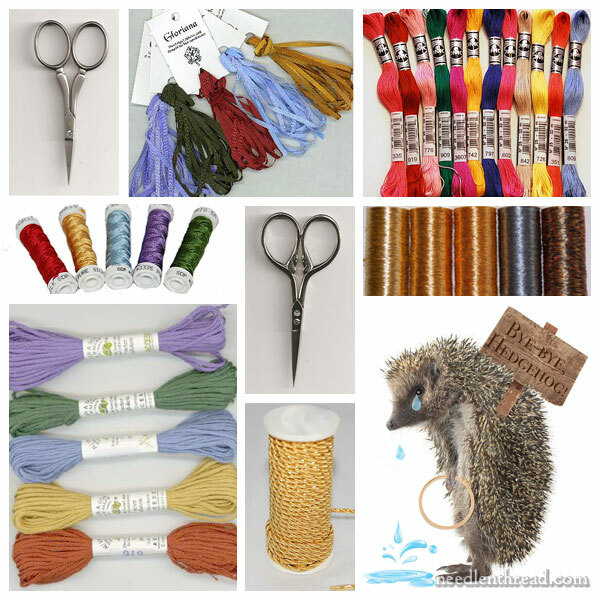 Earlier this spring, I told you that one my favorite embroidery shops, Hedgehog Handworks, is closing. Joady is retiring after many, many years of great service in the needlework world. The ‘Hog will be sorely missed! This week, though Thursday, June 15th, Hedgehog is accepting final orders from their website. Everything is marked down at least 25%, so it’s a good time to get some good deals on their remaining stock of needlework supplies. Here are some delectable things that are still available at the time of writing this, that are a really good deal and worth considering if you’re in the market for stash building, new threads, and new tools. August, 2017 update: Hedgehog is closed! Some needlework accessories, including thread winders, frame tacks, tool kits for stumpwork, and Scottish wool felt needlebook pages. A selection of good cotton embroidery threads, including coton a broder in different sizes and colors, floche (large skeins), Mountmellick thread, and flower thread. A selection of excellent silk and specialty silk threads, including Soie d’Alger (you won’t find it cheaper, and there are still a lot of colors available), and other Au Ver a Soie silks. Wool threads, including Fine d’Aubusson and Renaissance Dyeing. There’s also a Silk Ribbon Embroidery Mystery Bag available, containing YLI silk ribbon in various sizes, which would retail at $83, but is only $43. If you’re a crazy quilter or ribbon embroiderer, this is a great (and fun!) way to build some stash! There’s a metallics Mystery Bag< with an array of different metallics from Kreinik, DMC, Rajmahal and others. The retail value of the contents is at least $30, but the bags are $15. There's a Japanese embroidery thread Mystery Bag as well, with gold and silver Japan thread in various weights. Retail value is at least $65, the bags are $32.50. Some colors may be included as well. So, lots of stuff still available, and at a good discount. Joady stops taking orders this coming Thursday, June 15th. If you're planning any needlework projects in the near future with any of these supplies, now's the time to get them ordered! In the next few weeks, I’ve got quite a few topics to chat with you about! We’ll also chat about some specialty fabric for that’s not really meant for hand embroidery, but it’s jolly fun to stitch on! I’ll show you a current sample I’ve been stitch-doodling. How about a brilliant and affordable thread organization hack, especially if you like neat full skeins that hang? There’s some gingham embroidery for summer, with a free pattern. And we’ll talk about beads, from a different perspective. Packaging, you know! And more! I might even wax profound on one subject. You see, I’ve been sorting books and organizing the workroom…activities that make me think. August 17, 2015 Stash Building & Needful Things? August 22, 2016 Needlework Sales & Stuff! I’m looking forward to the gingham embroidery post during the Summer…. I received my last Hedgehog order the other day, and although I was happy with my new goodies, I’m a bit sad to see Hedgehog go. I loved that I could call and Joady could almost instantly tell me which thread or fabric or whatever I needed. I swear she had the DMC color numbers memorized! Best of luck in your retirement, Joady! How we’ll miss you! P.S. The Japanese thread mystery bag is such a treat! If there are any left, I urge y’all to order one! I’m very sad to see Hedghog Handworks close, but I do wish Joady a happy retirement. I loved their fabric that they sold as I can’t get purchase them here in the UK so I will miss them. I’m looking forward to your future posts especially the speciality fabric and the thread organisation hack and beads, I love beads. I’m looking forward to your room organisation. I do hope you have a great stitching weekend. Gahhhh! I just spent about $100 on silk thread! I haven’t used it before, but this seems like the perfect opportunity to begin. I can’t wait! I want to add that I am an absolute beginner, having begun embroidering on my 45th birthday (at the end of April this year) and with only 3 completed projects under my belt. Everything I’ve learned has been from you and your posts & videos, Mary. I am so in love with this new skill, and I feel like my abilities improve by leaps and bounds with each stitching session. Thank you so much for providing such an incredible, deep resource. I wouldn’t be doing this if it weren’t for your guidance and hard work at providing smart, simple instruction. I have photos of my projects so far, at my Instagram account (@nojuju). The latest one is a portrait if Iris Apfel & every bracelet & bangle is based on a stitch I learned from your video library. Thanks again! Next Next post: Needlework News Snips – Lights, Inspiration, and Action!